If you regularly barrel down Sunset you probably don’t even notice those ubiquitous billboard any more. But there’s an art installation surrounding the parking lot on Sunset near the Tower Records building that surely will capture your attention. 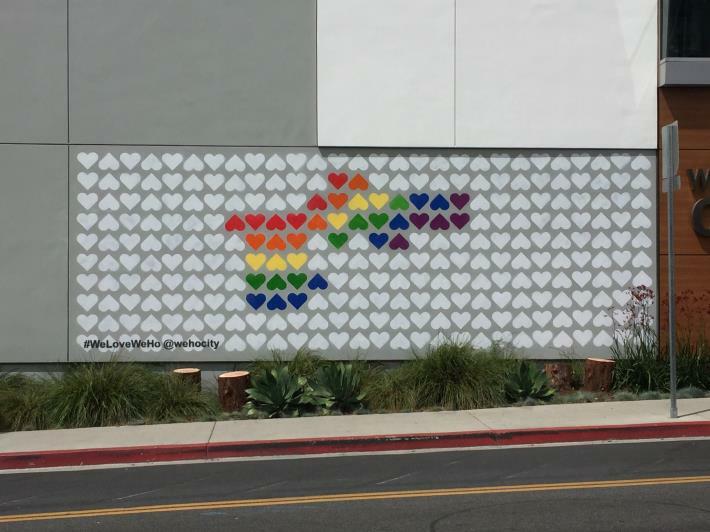 It’s “Pattern Park,” a brightly and quirky array of sidewalk images and some on the fence that are intended to reflect the diversity of West Hollywood, and certainly reflect the style of The Art of Chase, the artist who created it. The recently completed Pattern Park is the fourth and final in a series of micro-parks installed by the City of West Hollywood. It surrounds the parking lot located on the north side of Sunset Boulevard from Sherbourne Drive to the east and Horn Avenue to the west. The micro-park features fence and sidewalk art using spray paint, exterior latex paint and stencils that transform the sidewalk, curbs and ticket booth of the park area. The artist’s signature “Dancing Eyes” are fabricated out of laser-cut wood, then painted and affixed to the fencing. A city announcement of the installation notes that Chase (The Art of Chase) “is known for his quirky and humorous paintings that create disruption in our day to day lives. After moving to Los Angeles from Belgium in the 1990s he began his foray into the street art world on a large scale, seeing a raw city open to creation, offering a new mode of communication through imagery and quirky text. His determination, fueled by his mantra “where there’s a wall, there’s a way,” has given rise to international opportunities and more than 350 murals worldwide. The temporary micro-park installations are a project of the city’s Micro-Park Pilot Program, which activates underused spaces within West Hollywood during the renovation of West Hollywood Park. 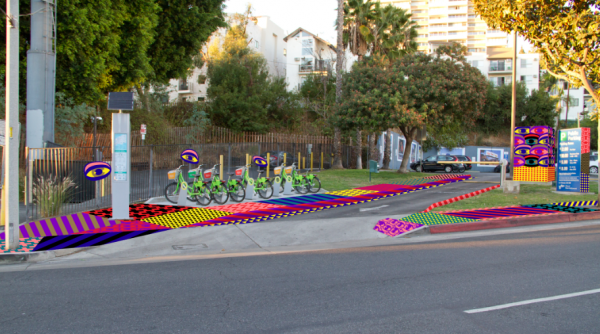 Kaleidoscope, TinyParks and #WeLoveWeHo were the first three of these four installations, which are expected to remain in place for 12 to 18 months. 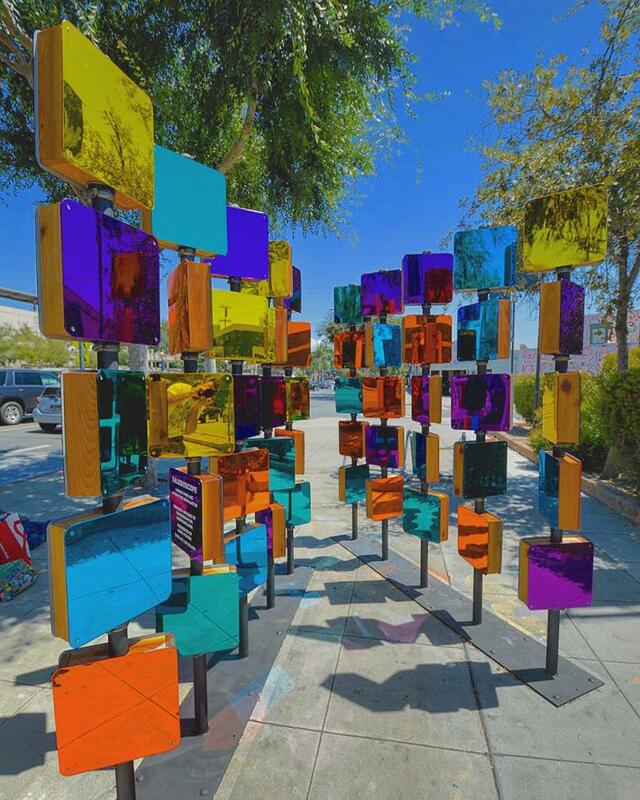 –Kaleidoscope, designed by Daveed Kapoor of Utopiad and Rob Berry of Berry and Linné is located on the west side of West Hollywood at the northwest corner of Santa Monica Boulevard and La Peer Drive. –TinyPark, designed by June Street Architecture and UrbanRock Design is installed on the east side of West Hollywood on both sides of the intersection of Santa Monica and Vista/Gardner. –#WeLoveWeHo designed by Moore+Friesl is located in mid-city on the eastern wall of West Hollywood City Hall at 8300 Santa Monica Blvd. at Sweetzer Avenue. 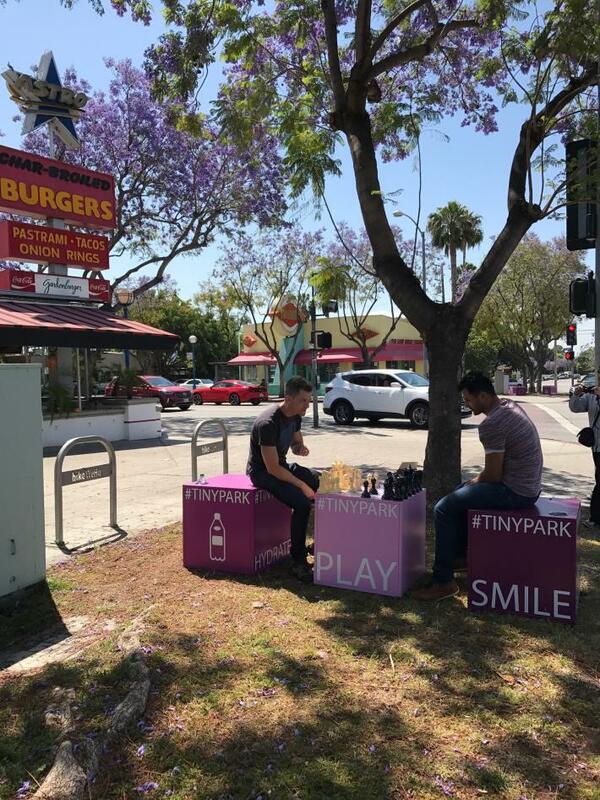 As with all of the micro-parks, pictures and selfies are encouraged – photos can be shared on social media for all to enjoy – be sure to tag @WeHoCity and use the hashtag #micropark. Isn’t Kaleidoscope installed on the southwest corner of La Peer and Santa Monica? That Sunset installation hurts the eyes. Make it stop! Drove by this installation today. Did someone actually pay for this or better yet did someone actually take time to contemplate this? If so I bet I could concoct plenty of nonsense for sale and diversion. Was there a coded RFP for this? Great work if you can get it. The ‘Tiny Park” at Gardner/Vista and Santa Monica Boulevard are embarrassing. It is a very public statement from City Hall about how it envisions the eastside of town. I pass these ‘parks’ several times a day and it never fails to disgust. Usually too dusty and dirty to sit at, if you would at all, the graphics are necessary to say it’s a park otherwise people might assume someone tossed some crates on the side of the road. The barren soil around the trees could benefit from the same ground cover that the City installed for dogs to defecate on, but that would likely cost to much to use on an area intended for people. We have lost all our community gardens in West Hollywood. To improve the quality of life we need real greenspace with shade. Sitting at a busy intersection with traffic probably isn’t very healthy. We need to expand existing parks and create new ones. These little pockets of creativity are nice splashes of color but don’t excuse or hide the overdevelopment our City is allowing…if not promoting for income purposes. And yet the MAJOR property on the corner of Santa Monica Blvd & Crescent Heights remains fenced with an unknown future or at least not publicized by the owners, The City of West Hollywood aka “us”.